New applications keep emerging for UV printing based on long-lasting, energy-efficient LEDs as a curing source. According to Yole Developpement, a global research company based in France, the UV curing market is expected to expand to approx. USD300 million by 2019*3. Demand for high-speed UV printing is rising especially among wide-format inkjet billboard-printing applications, coating applications and adhesive applications. Design requirements increasingly specify an air-cooled UV light with high output for higher productivity. Using Kyocera’s ceramic substrate, with its excellent heat conductivity, and a heat-radiating design incorporating a heatsink, Kyocera’s G5A system provides the world’s highest UV intensity (24W/cm2) among air-cooled UV-LED curing lights. 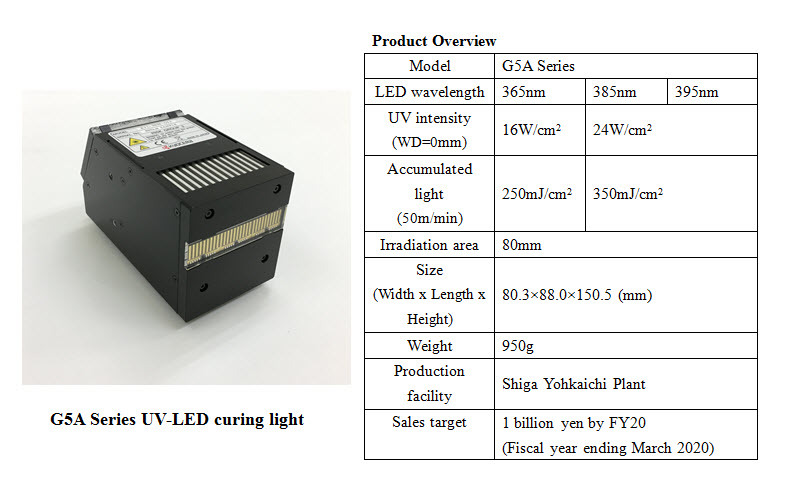 In addition, it can achieve 350mJ/cm2 (50m/min) of accumulated light, an important indicator of curing performance, thus enabling high-speed curing. Kyocera Corporation (NYSE:KYO)(TOKYO:6971) (http://global.kyocera.com/), the parent and global headquarters of the Kyocera Group, was founded in 1959 as a producer of fine ceramics (also known as “advanced ceramics”). By combining these engineered materials with metals and integrating them with other technologies, Kyocera has become a leading supplier of electronic devices, semiconductor packages, printers, copiers, mobile phones, solar power generating systems, cutting tools and industrial components. During the year ended March 31, 2017, the company’s consolidated net sales totaled 1.42 trillion yen (approx. USD12.7 billion). Kyocera appears on the “Top 100 Global Innovators” list by Clarivate Analytics and is ranked #522 on Forbes magazine’s 2017 “Global 2000” list of the world’s largest publicly traded companies.